They’re often touted as the toughest animal on the planet. Tardigrades – also known as water bears – can survive extremes of cold, heat and radiation, and even the vacuum of space. Now, scientists in the US have identified a set of proteins unique to the creatures that that help keep them alive and unharmed when they are dried out – even if the desiccation lasts for years. 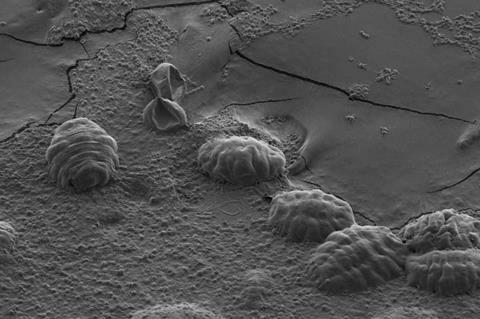 Water bears’ extreme drought tolerance has always been something of a puzzle for researchers. Other drought-resistant organisms, such as yeast and nematode worms, are able to survive because their cells contain a sugar called trehalose, but this is not found at high levels in tardigrades. By looking at patterns of gene expression in tardigrades, researchers at the University of North Carolina at Chapel Hill isolated proteins they dubbed tardigrade-specific intrinsically disordered proteins (TDPs) that were expressed during drying out periods. They showed that introducing TDPs to other organisms such as bacteria and yeast enabled them to survive desiccation. Further investigation suggested TDPs protect cells in a similar way to trehalose sugar – by forming glass-like solids as they dry out rather than crystals. The team says these proteins could have important potential uses, such as engineering drought-tolerant crops or enabling sensitive drugs to be stored at room temperature.